Shelly Orozco with her daughter Rosa, Alejandra and Jazmeen, who received free backpacks at the Back to School Bash at Clark Park. About a thousand children and parents came to our “Back to School Bash” at Clark Park on Thursday, August 16. The event was organized by our Children, Youth and Families division and Family Alliance for Change. 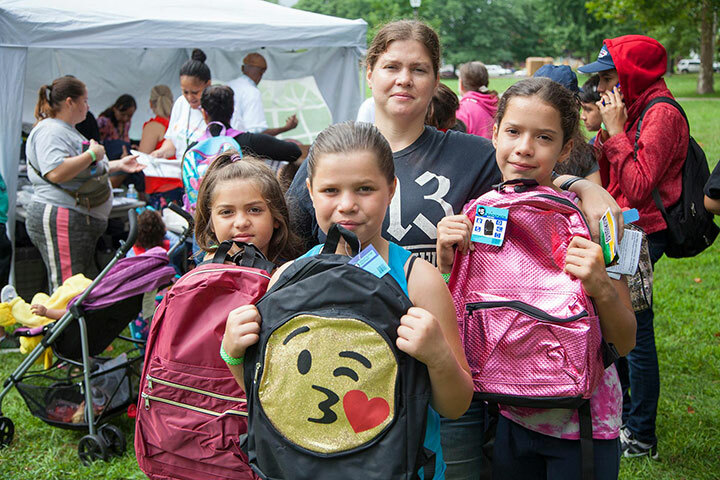 At the event, 300 schoolchildren received free backpacks containing school supplies. In addition, 150 school uniforms were given away. All the families enjoyed the food, refreshments, and fun activities, including face-painting, bounce houses, and music. The Back to School Bash was sponsored by the Detroit Wayne Mental Health Authority and Family Alliance for Change. See the photo essay on Facebook.